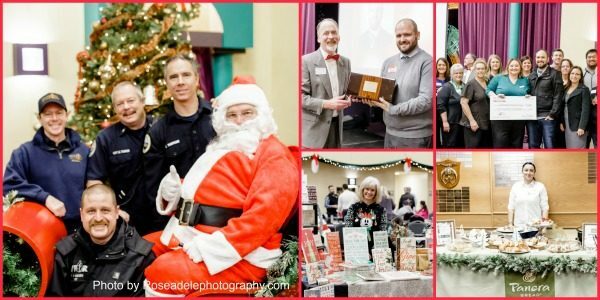 On Wednesday, December 12, 2018, the Wilsonville Area Chamber of Commerce hosted our 2018 Annual Meeting at the Al Kadar Shriners Center and attracted over 130 Chamber attendees. The event was sponsored by Kindred Spirits Planning & Design, Prographics Services, Inc., Pacific Connections, Poppies, and Paisley Floral, and Rose Adele Photography. This year’s theme – “A Taste of Wilsonville” where 12 Wilsonville bakeries, caterers and restaurants shared their delectable food by offering guests the opportunity to sample their cuisine and learn more about their menus and offerings. 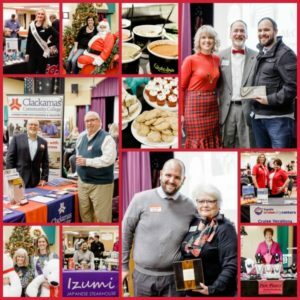 Participating in the tastings were the Corner Coffee Shop, Holiday Inn South, Izumi Japanese Steakhouse, Lux Sucre Desserts, Panera Bread, Qdoba Wilsonville, Rêver Artisan Bakery, Shari’s Pie & Café, Swire Coca-Cola, Tom’s Wilsonville Catering and Week Day Wine Club. Chamber Board president Kevin O’Malley conducted the business meeting and shared recaps and highlights from our year, and Santa (AKA George Crace, The Total Development Center) stopped by to wish everyone a joyful holiday season! Several outstanding Chamber leaders were recognized for their leadership, partnership and innovation as the 2018-2019 new Board of Directors President, Jason Jordan of Republic Services was sworn in and four outstanding Chamber leaders were recognized. Congratulations to our award winners and thank Outgoing Board President, Kyle Bunch of American Family Insurance for your two years of dedicated service to the Chamber! President’s Award – Donna Atkinson, Wilsonville Community Seniors, Inc.
A special thanks to our Board of Directors and Chamber Ambassador Team, many of whom were in attendance, for their continued support of the Chamber. November is truly beautiful to behold. Vibrant fall foliage paints the trees but seeing friends and family during the holidays is an even more welcome sight. Taking in the eager, smiling faces set around a magnificent Thanksgiving dinner creates memories that last a lifetime. Vision is something we all take for granted. As the turkey is carved and thanks are shared, it’s also a good time to think about a disease that affects more than 30 million Americans and unbeknownst to many, can lead to blindness. 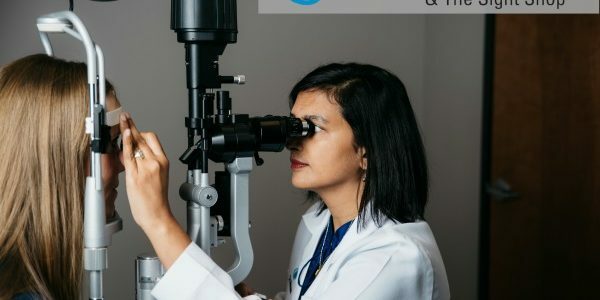 For mid to late-stage patients, there are medications that can be injected into the eyes, and surgical measures can be utilized for advanced symptoms. Laser photocoagulation is a minimally invasive procedure that seals leaking blood vessels or retinal tears and can destroy abnormal tissues. To repair extensive internal damage, a vitrectomy, where some of the vitreous humor is removed from the eye, is also an option.